If you are in Calgary from October 15 to December 19, 2015, you cannot afford to miss this exhibition at the Nickle Art Gallery, University of Calgary. 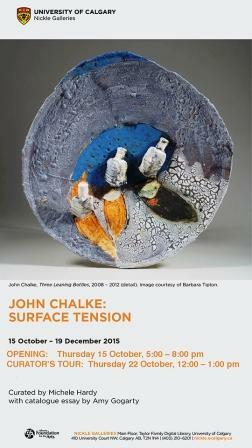 Curated by Michele Hardy and with a catalogue essay by Amy Gogarty, the show promises to be a much needed exploration into the ceramic art of that icon of Alberta ceramics, John Chalke. Visit, learn, enjoy. And let me know how you liked the exhibition. This entry was posted in Alberta, Ceramics, Exhibition and tagged Alberta ceramics, John Chalke on October 13, 2015 by Barry Morrison.